The PCL gets much less attention than its anterior partner. What might be going through Zlatan’s mind? If we start with a player who has suffered an isolated mild to moderate (Grade I-II) PCL injury, we find the player can do well with quality physiotherapy reahabilitation because because surgical reconstruction tends to improve the grade of instability but it does not provide the player with a normal knee. Acute PCL injuries with bony avulsions are treated surgically. Most isolated Grade III lesions can be treated non-operatively using a specially designed PCL brace that holds the tibia in an anterior reduced position that gives the PCL an opportunity to heal. Unlike the common intra-articular ACL tear, acute isolated PCL injuries can heal. In the case at hand, it is NOT an isolated PCL injury. 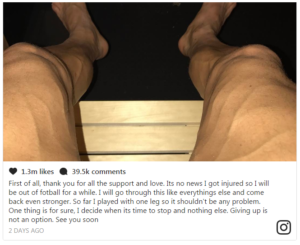 Media reports suggest Ibrahimovic also had an ACL injury (with the possibility of posterolateral corner injury not being mentioned but still present) A multi-ligament injury has the potential of neuromuscular injury which, when present, has an ominous prognosis. Even without that complication, the prognosis must be very guarded for an elite level football player to return to the demands of high level play with an ACL/ PCL reconstruction. My goal when seeing similar patients is to ensure they have a stable knee they can walk on and live with. There are anecdotal reports of athletes returning to play after multiple ligament knee reconstruction but when scrutinised, the players are usually the slower lumbering players like football lineman — not players whose success relies on them being quick and agile. It’s important for the clinicians involved to spend lots of time explaining prognosis to players who suffer serious injury and the rehabilitation team must communicate well and work together. 1) Does everyone who ruptures her/his ACL need a knee reconstruction? 2) Does arthroscopy benefit the patient with knee pain and a proven meniscal tear on MRI? Professor Hutchinson is the star of BJSM’s YouTube page where his pearls on how to examine the knee, shoulder, hip, groin have been viewed over 6 million times. Thanks Hutch!